Ancient Mayan ruins found across Guatemala. From the Mayan ruins of Iximche to the more recent colonial Spanish influence, Guatemala’s history takes you through thousands of years of interesting tales and stories. The Mayan ruin of Iximche – which was once the capital of Guatemala in 1524 – is a site whose name translates into “Maize Tree”. Here we’ll take a tour and discover the stories of this ancient civilisation. A mother spider monkey crawls across greenery with her infant on her back. 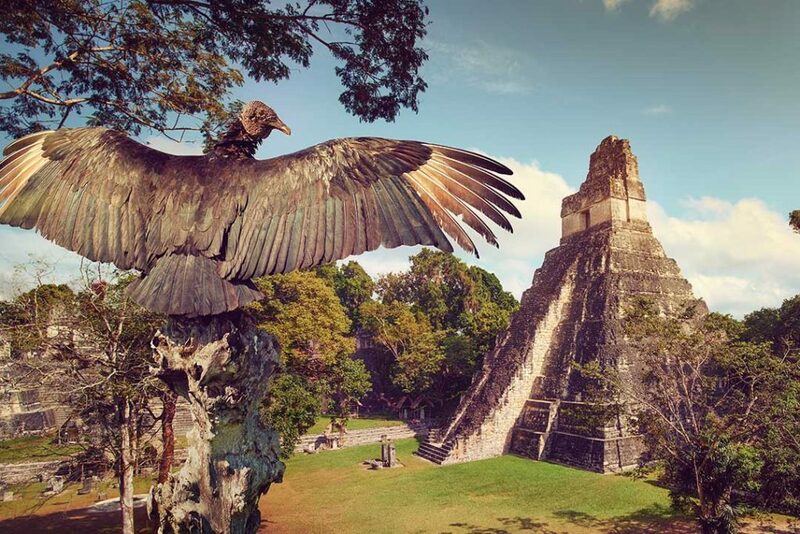 It’s not all ancient history in Guatemala, there’s a lot of nature to take on board too. Lake Atitlan and the Atitlan Nature Reserve – both places we’re going to next year – are full of indigenous species such as the spider monkey and butterflies. The lake itself is regarded by many as one of the most beautiful in the world, so it’s something not to be missed! Get in touch with nature, as we kayak across the lake, walk through the forests and can even zipline across the skyline! Guatemalan women balancing woven materials on their heads. The true beauty of Guatemala lies in its people, a country brimming with tradition and a sense of pride beaming from the locals. With strong influences from the Mayan era and Spanish Colonialism, Guatemala is an eclectic mix of cultures and this is reflected across the country. For example, did you know that there are over 20 languages commonly spoken across the country? Find yourself immersed in the culture of the locals and meet the people who make this country so incredible as we journey through Guatemala! 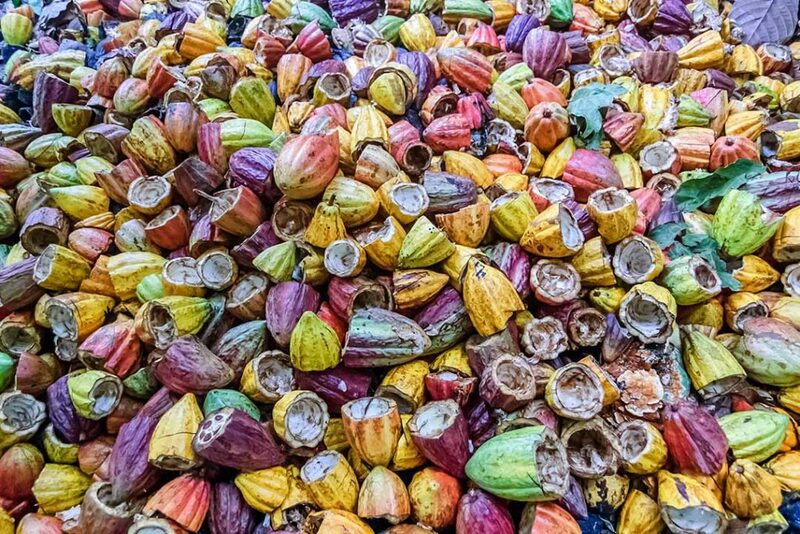 Discarded colourful cacao pods, from bright yellow to a deep pink! From chocolate and spices to delectable coffee, Guatemala is the home of flavour. The national dishes of Chiles rellenos tamales, stuffed Chile peppers, and Kak’ik, a Mayan spiced turkey soup, demonstrate the country’s love of all things flavoursome, both sumptuous blends of spices and herbs are sure to leave you wanting seconds! What’s more, it’s widely believed that Mayan’s created chocolate, so where better to sample some of the world’s most delicious treats? Experience the craft of chocolate making, as we visit a chocolate workshop, where we’ll get to create (and eat) our own chocolate! 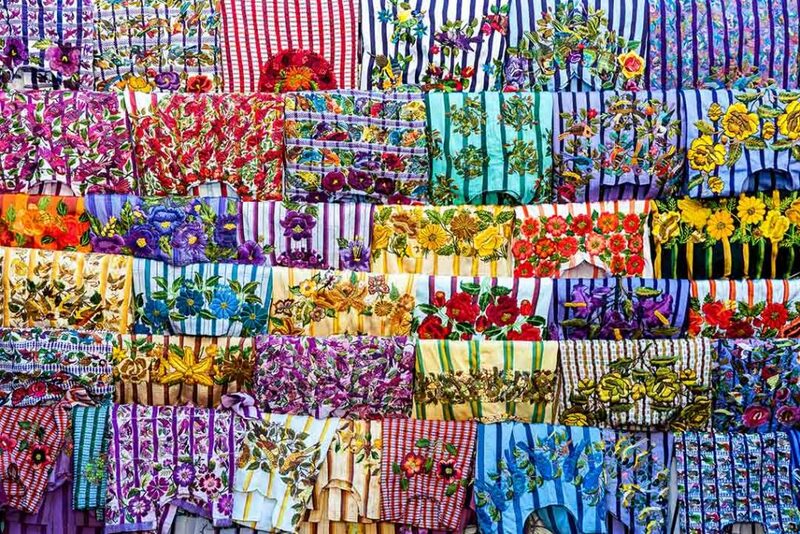 Brightly coloured woven clothes, representative of the vibrancy of Guatemala. Guatemala is the country of colours! From ancient Mayan art that is displayed across the country, to brightly painted houses, every inch of this country is awash with dazzling tones. The colours found across the country are not just to look nice but are an indication of heritage and descent, with locals wearing different coloured yarn clothing that represents the villages they grew up in! Guatemala is a country full of vibrancy, with its own unique story to tell. 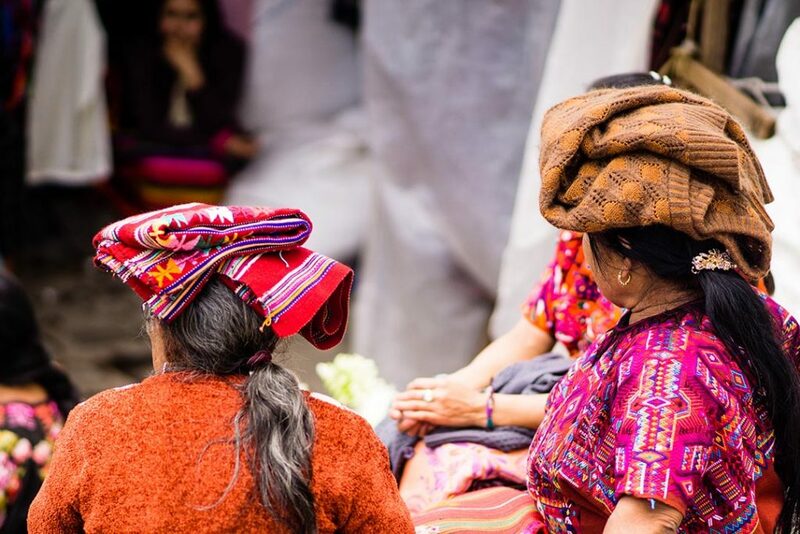 If you want to find out more about Traveleyes hands-on ethical tour that immerses you into the Guatemalan culture, then click here!